spikes of brightly colored sweet pea-like flowers from June to August, that are favored by Hummingbirds and Butterflies. 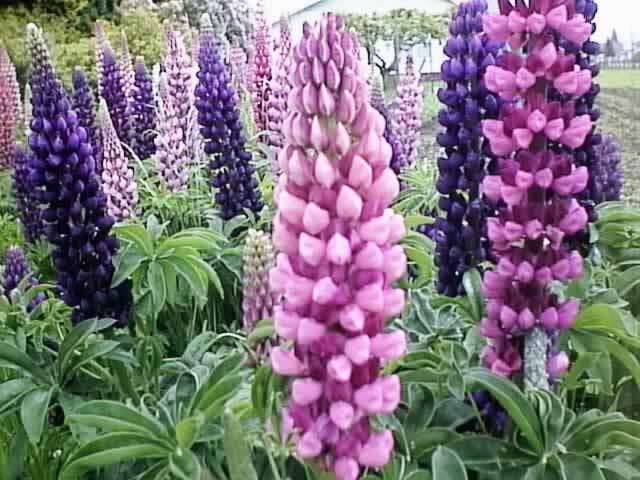 There are two hundred different species of Lupines, in a family that includes annuals, perennials and shrubs. There are only a few varieties that are commonly grown in home gardens. Russell Lupines are by far the most popular. 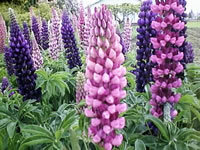 They were developed by a gardener named George Russell, who held a fascination for growing different kinds of Lupines. In the early 1930s, he started collecting the best seeds from the plants that had cross-polinated between his L. polyphyllus and L. hartwegii. In 1937, Mr. Russell released his first batch of seeds to the public. Their beautiful foliage and brightly colored, 3 ft. spikes of flowers made them an immediate success! Lupinus texensis is the Texas state flower. It is a bushy, low growing annual plant that is easily grown from seed and quick to flower. The Texas Blue Bonnet produces 12" spikes of blue and white flowers in late spring. 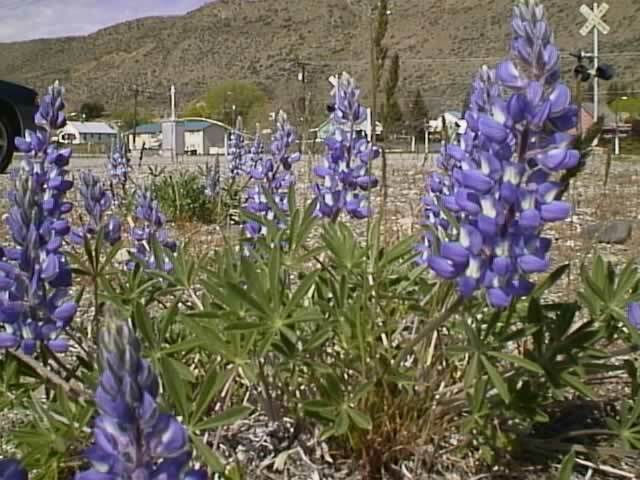 Lupine grow best in climates with cool wet winters and long hot summers. They will flower best if they are grown in full sun. They should be planted in moderately rich, well draining, slightly acidic soil. Feed monthly with a good all-purpose fertilizer until the plant begins to bloom, then no further feeding is necessary. Water regularly and thoroughly during the growing season. Apply a heavy mulch in dry regions. Remove spent flower spikes promptly to prolong the life of the plant! Beware of slugs and snails!. They can destroy a Lupine in one night! Lupine seeds have a very hard seed coat, so you will need to soak your seeds in warm water for 24 hours, or nick each seed coat before sowing them. Seeds can be sown directly in the garden where they will grow, as soon as all danger of frost has passed in the spring. If you intend to start your seeds indoors, maintain a temperature of 55°-70° within the growing medium. Annual varieties will germinate in 15-20 days. The seeds of perennial Lupines take 20-25 days to germinate. Use care to protect the taproot when transplanting! Lupine plants can be propagated with cuttings or by division in early spring.